Welcome to Whistler! Whether you are in town for a day trip or an extended vacation, drop in and speak to one of our friendly and professional team members for up-to-date information on what's happening around town. We can assist with everything from accommodation and bus schedules to directions and activity information – just ask! 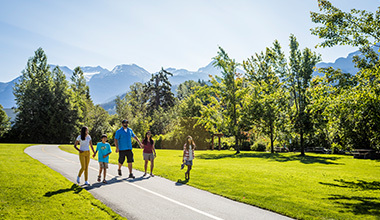 The Whistler Visitor Centre is Whistler’s official resource for all in-resort information (activities, dining, accommodation and transportation). The Visitor Centre offers a range of products and provides quick, accurate and friendly service. As well as up-to-date information on everything Whistler has to offer, the Whistler Visitor Centre is the first point of reference for tourists to gather information about other communities in the beautiful province of British Columbia. Guests are welcome to come in and explore a wide range of information on accommodation, tours, events, recreational opportunities, parks and other provincial destinations. The staff are both knowledgeable and resourceful, ready to assist visitors and community members alike with their travel planning. Drop in for advice, or if you prefer, Whistler Visitor Centre agents are also availabe to answer questions by phone and email. * Hours are subject to change. Where is the Whistler Visitor Centre? The Whistler Visitor Centre is located at 4230 Gateway Drive Whistler, adjacent to the bus and taxi loop. Parking is available outside the Centre for 15 minutes, or you can park in the Day Lots located on Blackcomb Way. No one knows Whistler better than the Insider. Browse the blog for tips, seasonal news and the latest on upcoming events.